She's Fantastic: Vintage Goodness: The Women of M.A.S.K.! The first figure of the pair is the villainous Vanessa Warfield of V.E.N.O.M. (Vicious Evil Network of Mayhem). She was released in 1987 with her Manta vehicle (A purple sportscar that transformed into a plane) and her Whip Mask (which emitted electric "whips" to attack her enemies. 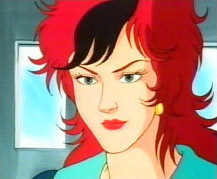 80's Cartoon Villianesses are my weakspot. Baroness, Evil-Lyn, Crasher, Nightshade... I beam just thinking about their wickedness. Vanessa Warfield ranks right up there with the best of them. Plus the streak in her hair is killer. 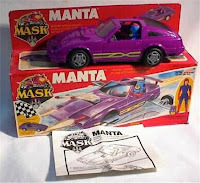 The image of the Manta vehicle is from figure-archive.net, click the pic to check out the site and see more photos. Next up is the glorious Gloria Baker of M.A.S.K. (Mobile Armored Strike Kommand). 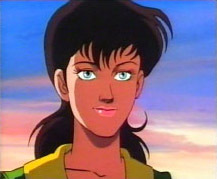 She was released in 1988 as part of the Split Seconds sub-line with her Stiletto vehicle (a white sportscar that transforms into a plane AND an attack chopper), her New Collider mask (which enables her to make a hologram clone of herself), and a second "clone" figure of Gloria in clear plastic. From what I gather online, I think fans were not too happy with this Gloria figure. Most of the gripes center around her not being paired with her standard vehicle and her not really looking like her television counterpart. I'm not much of a pessimist, but I agree she kind of looks like my father. Once again, the image of the Stiletto vehicle is from figure-archive.net, click the pic to check out the site and see more photos. And finally a group shot. From Left to right: Dino-Riders Serena, Vanessa Warfield, G.I.Joe Natalie, Gloria Baker, Battle Force 5 Agura. I didn't watch MASK back in the 80's, but I had figures of Vanessa and a dark-skinned guy in an orange suit. I used them as substitute Dino Riders figures. I would watch it occasionally, but I wasn't obsessed. My older brother got the green motorcycle/helicopter thing with the yellow pilot for his birthday one year and I was really jealous. Then we would all get occasional figure packs etc over the year. That's impressive that you had a Vanessa, I didn't know the toy of her existed until I was an adult. Another thing that pissed fans off about the Gloria figure was Kenner took so damn long to make her. By rights she should have been in the first or second wave of toys with her Shark vehicle and instead she wasn't made until around the 4th assortment and packaged in the poorly designed Split Seconds series. On top of this DIC had sabotaged the cartoon when for no real reason they changed the entire dynamic of the series. It went from a team of specialists fighting against a terrorist group to everyone competing against one another in cross country races for prizes and everyone suddenly knew each other's secret identities so it ruined half the reason they wore the damn helmets/masks. It would be like if G.I Joe was suddenly turned into Hanna Barbera's Wacky Races. Btw the racing series cartoon lasted 8 episodes and was cancelled. So yeah Gloria never properly got her due as a figure nor did the Shark vehicle ever get made despite what some online con artists are trying to sell fans as "lost or limited production prototypes". Any Shark vehicle you find online are kit-bashed models. It's also a shame the IDW comics revival of the series was such an SJW fueled mess so the chances of seeing a proper MASK revival and a decent official Gloria Baker toy are slim to none.